Software development services have expanded in quality and variety, offering many possible ways to interact with developers and complete projects. Correct cooperation model is an essential step for a successful partnership. It will save you money, won't put you or the team to constant stress tests and will result in the product that you love, and the developers consider finished and polished. Despite the claims that professional companies can adjust to any task, major setbacks due to poorly chosen cooperation model are almost guaranteed and might even result in a ruined relationship and mutual hatred. Carefully chosen company and fitting cooperation model is nearly half job done. What finances can you spare to build the software you need? Precise numbers don't matter as much here, but the flexibility does. If you have a set amount to spare and you want to fit into that sum whatever it takes, the fixed price model is the only one that is going to satisfy you. If you're ready to invest further until you get the product, then other options become available. Will you trust your project to the company's management and nobody else? You give them the idea, the functionality (or discuss it together) and leave them to their business until the deadline day comes. Or you like to be involved in building the team and influence various departments? Communicating with the developers, designers, etc. Would you give your opinion on every single button or font size or focus on broader stuff? Will you request weekly meetings with developers to review their progress or you trust them completely? There is no ultimately correct way to approach all three aspects. It’s about what kind of a business style you like and which cooperation type favors your needs the most. Once you get that sorted out, it will be simpler to choose a model and a company for partnership. Have trouble finding the best possible ways to build your product? Contact our specialists and get professional advice here, at contactus@inveritasoft.com. If you're unclear about what to add to the app or know all concepts but have no idea how to implement it practically, then this is the model that might suit you just fine. Mid- to large-sized companies are the perfect match for this approach as well. You pay for the time that developers spend working on your project. Financial flexibility. 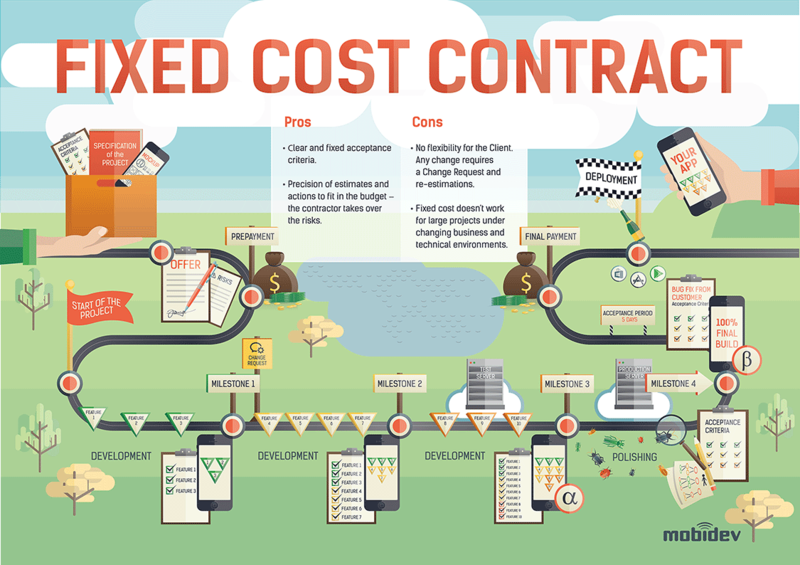 This approach allows better budget management on the go. You don't have to pay all the sum upfront, but in small portions on a negotiated time. The payment covers hourly rates of the team that works on your project. You can adjust the money spending by adding or removing features in real time, as this model allows a dynamic response from the team. Development precision. Since you're paying hourly rates and not the whole price for a strict deadline, you can polish all aspects of the software. 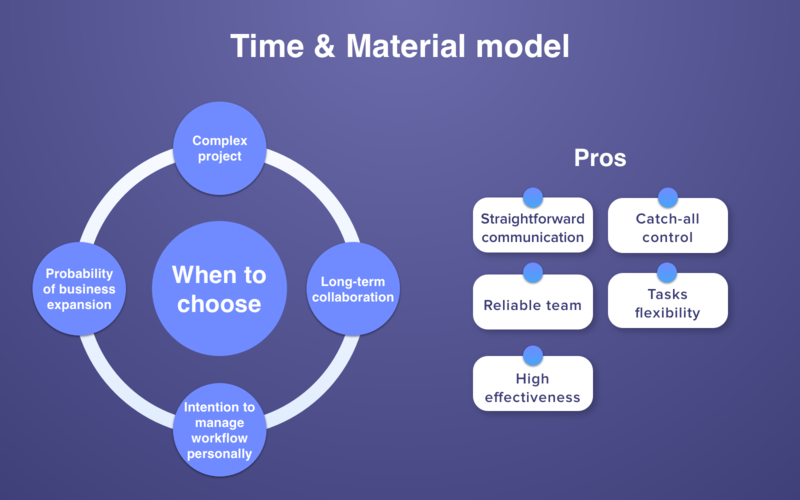 If immediate changes are required, the team is ready to do it straight away, as this cooperation model allows change of plans in the middle of the development cycle. Simpler management. Time & materials model breaks down the process into smaller steps. By setting smaller goals you can proceed step by step, evaluating the financial situation, development status, need to add a new feature or reduce the workload on the staff if deadlines are met in advance. Some clients and companies state that this approach is ineffective for small projects or limited budgets. You may need more time and effort to get the polished product, thus stretching the spendings further and potentially going over the budget limit. Team cohesion. You are the one to approve or disapprove the staff selection for the project. The client has full authority to choose the offered developers based on their motivation, hard and soft skills, experience in the area, etc. After a certain amount of time passes, the team will understand your ideas better and be used to the work processes more, thus increasing the overall efficiency. Full commitment from the developers. A dedicated team is assembled to tackle your project and nothing else. The team works solely on your product, and you're the one managing the process from a close distance. It is a new development department within your company's structure that will cease operations after all work is done. Agility: cost & workflow management. Since the dedicated team is under your authority, you can adjust the process any way you see fit. Increasing the number of developers to catch up with projections, reducing individual workload, adding/removing functionality to adjust the cost and so forth. The downside of this approach is that it costs more time and money than Time & Materials model. The assembly of the team will take more time and can stall the project. Committed and skilled professionals might require more significant hourly rates, increasing the development costs further. If the project is small, the Dedicated Team model is inefficient due to the time it takes to implement it to full scale. Probably the best type of cooperation and payment for small to mid-sized projects. With smaller solutions, it is easier to negotiate completion dates, prices, functionality, technology to use, etc. It is easier to predict the development process for a simple photo editor with a dozen filters than for a full-scale e-commerce store that uses APIs and synchronizes all data with other existing services, for example. Clarity in targets and budget. Fixed Price model allows to set the price and define the milestones before the sides sign the contract. The software developer receives the acceptance criteria, while the client can expect the service provider to meet all requirements, as was negotiated previously. Precise completion estimates. Client and the service provider discuss the project and determine the estimated completion date together. Therefore the developers are motivated to complete the project in time, receiving the payment and boosting their reputation. The client, in turn, has an idea when the launch is going to happen. Financial and time security. Unlike Time & Material and Dedicated Team models, you know how much you’re going to spend even before the developers start working. Your budget won’t be stretched thin and the motivation to complete the work in time will also be beneficial for avoiding delays.